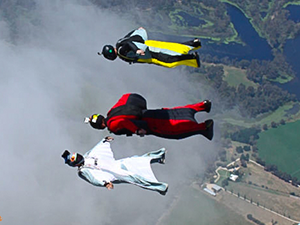 Skydive Nagambie is a full service dropzone, and the only centre in Victoria purpose-built for sports skydiving. Home of the Supervan 900, we go to 15,000ft on every turbine load. 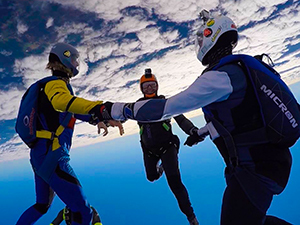 In a world of tandem factories, we are passionate about promoting and improving sports skydiving. The dropzone has a 24 bed air-conditioned bunkhouse for $10 per night, on-site camping and RV parking is free. Hot showers and toilets are provided for free for everyone staying on-site, and we have a licensed bar that opens after jumping has finished each day! And of course, we don’t charge any DZ fees. 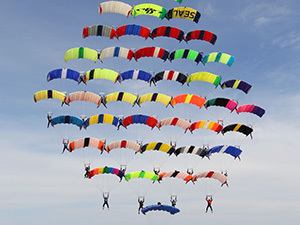 We regularly run events - from Star Crests and beginner angles through to advanced Freefly and Formation Skydiving training. 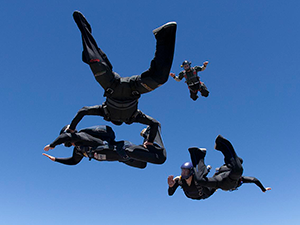 And we have world-class instructors and coaches on-site to help you learn, whether you want to learn CReW, do a Wingsuit first course or just improve your flying skills! We have our own 17-place Supervan 900 (Super Caravan) permanently on site, which runs to 15,000ft as standard! We also have a Cessna 182 for Hop ’n Pops and swoopers. And if you are planning a major event, contact us to enquire about multiple aircraft. Nagambie is nestled on the northern side of the Great Dividing Range. The town generally enjoys better weather conditions than Melbourne, as the ranges provide a natural shield from the coastal winds and rain. Even when it is cold, overcast and rainy in Melbourne, it is often blue skies here at Nagambie. Whether you need you reserve re-packed or a new lineset, we have on-site rigging facilities. Leave your rig after jumping on Sunday, pick it pack up the next weekend. Just one of the benefits of jumping at a full-service dropzone! For any Sports enquiries or to book for an event, please contact us at [email protected] or call the dropzone direct on (03) 5794 1466 or (International) +61 3 5794 1466.